Article 7-C. Average time to complete: Less than 4 minutes. 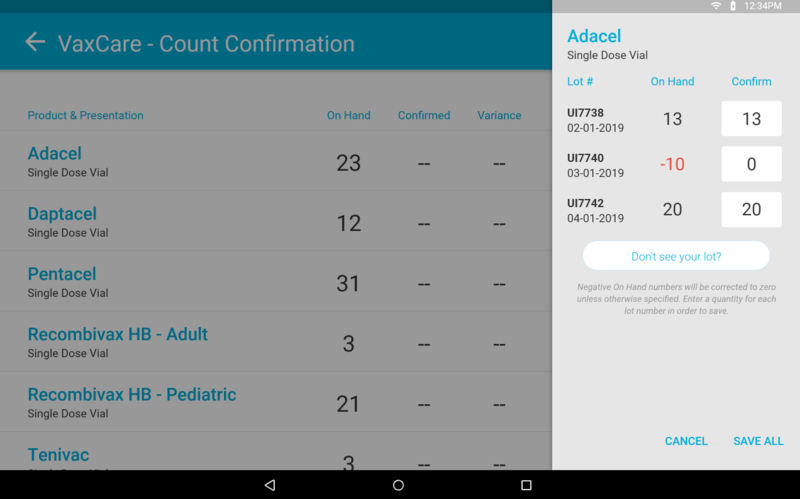 As of June 2018, VaxCare encourages all of our partners to complete a daily inventory count confirmation. 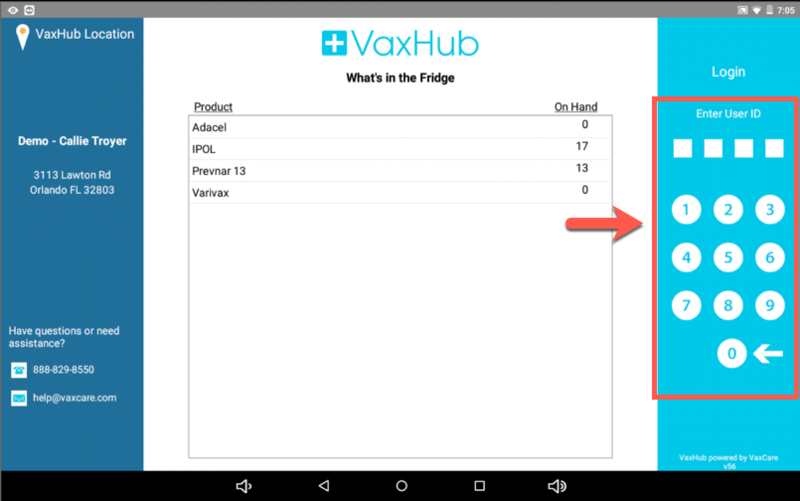 This ensures that we have accurate counts to run Automatic Vaccine Replenishment (AVR), helps us isolate errors, and provides a really easy way to reconcile any missing inventory on the spot. The best news of all? For being the absolute greatest way to keep inventory on track, it's also one of the fastest and easiest things to do! Confirming your inventory count. 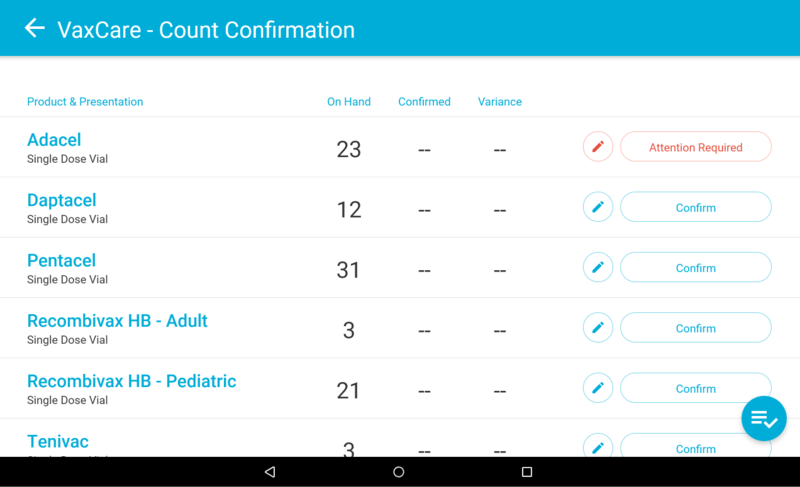 To begin a daily count confirmation, log in to the VaxHub. 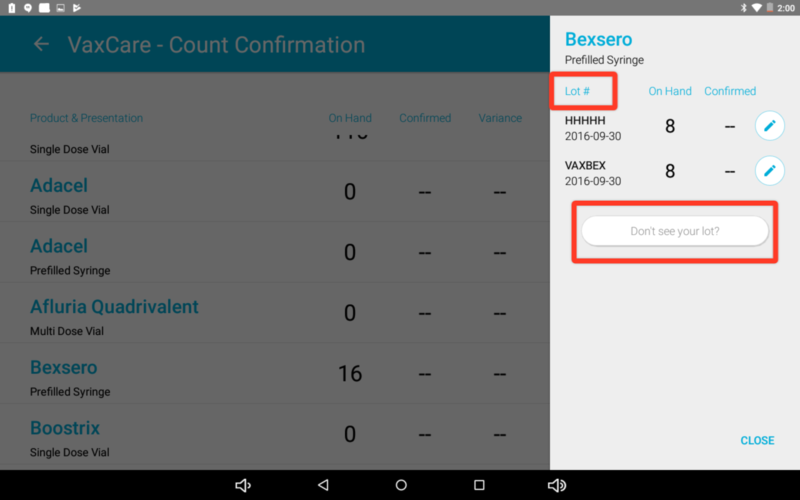 Next, tap on the menu icon in the top right corner and select “Count Confirmation”. Select your Inventory Stock to view counts for the current month. 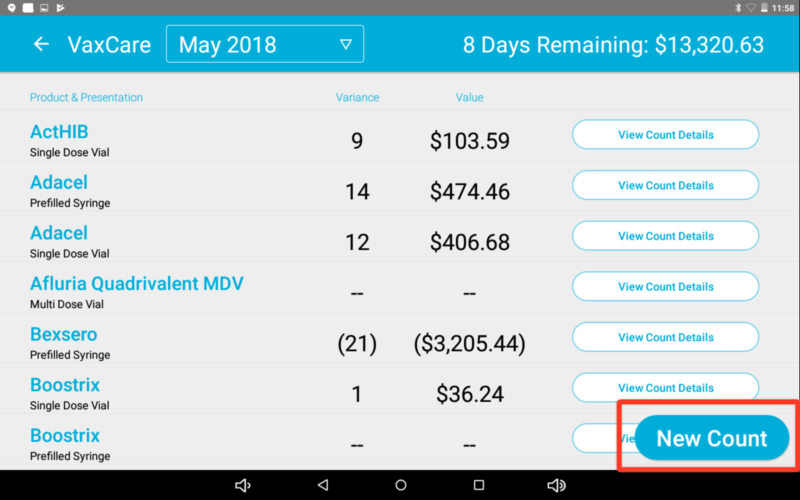 From this screen, you can see your current vaccine variances - the difference between what you should have on-hand and what you actually have on-hand. 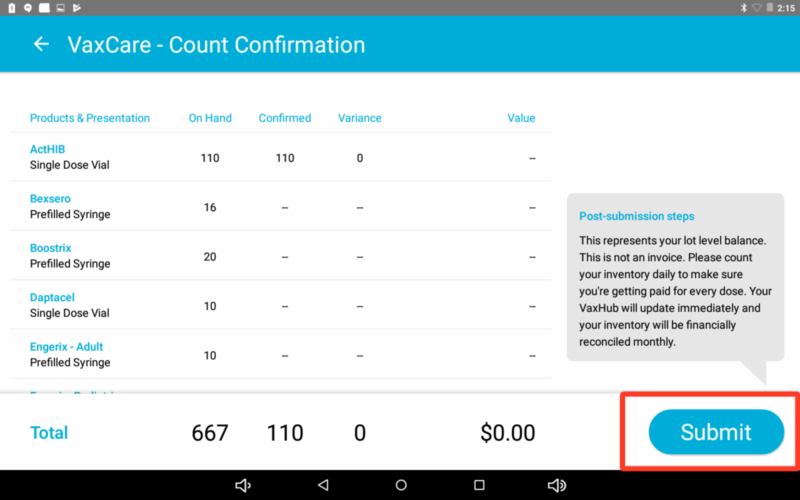 Tap on any of the blue "View Count Details" buttons to see past count history for that particular product. 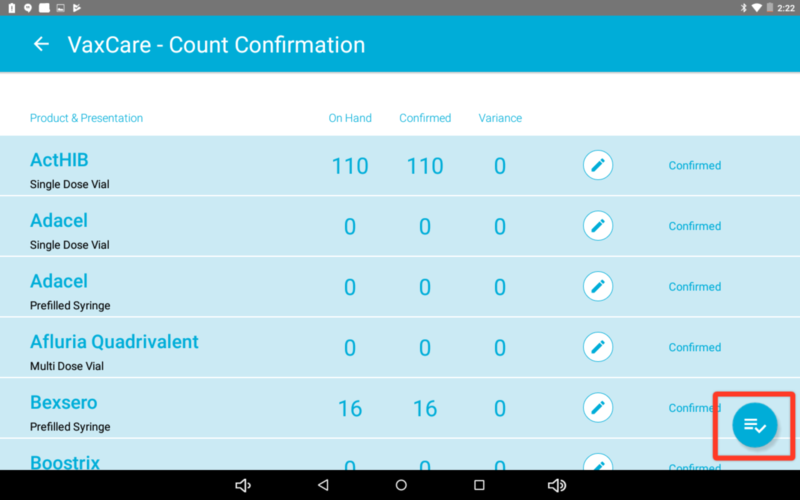 Note: This shows you previous counts when you actively counted this product, either by confirming or editing the count. It won't show you counts when you skipped over this product. Click "New Count" in the bottom right corner to start a new count. For each product, either confirm or edit the number of doses on-hand. We show the number of doses you should have on-hand under the "On-Hand" column. Click "Confirm" if the number of doses "On-Hand" is accurate. Click the pencil edit icon to adjust the number of doses if inaccurate. Lot information is only required when editing a count. You can either edit the existing lot numbers, or click the "Don't see your lot?" button at the bottom. You'll be prompted to enter the new lot number in the pop-up window. It is extremely important that you treat each lot number as a separate count. 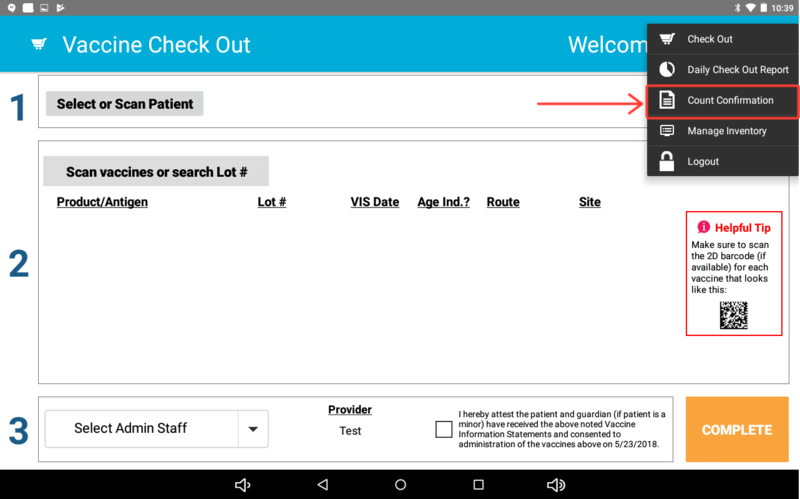 This helps us help you find any missing doses when and if a discrepancy occurs. When you’re finished confirming or editing all vaccine counts, click the check-mark icon in the bottom right corner. 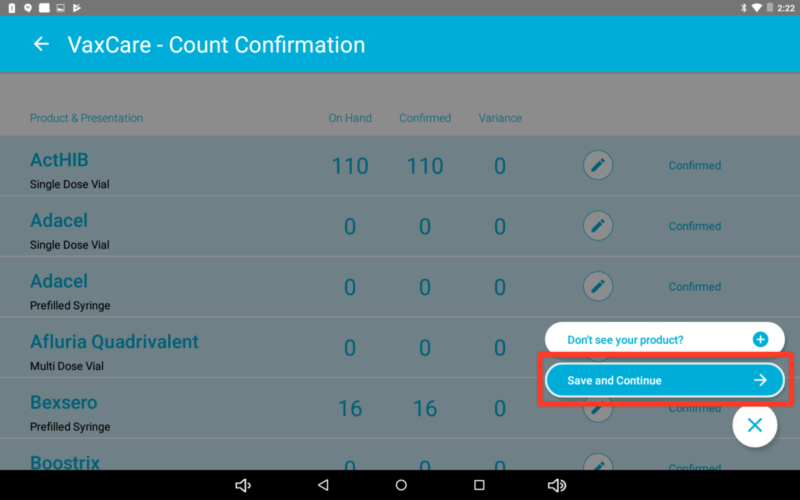 Select “Save and Continue” to review your count. And then hit "Submit" to automatically update your counts! Occasionally, an on hand amount will dip into a negative number. This can occur for a variety of reasons, for example, when applying a VaxCare dose to a VFC patient. You're almost done. To reconcile your inventory, continue to Daily Count Part 2: Reconciling Inventory. How often should you perform an Inventory Count Confirmation? Have a question? Click on the blue Intercom bubble to message our team. Or email us at help@vaxcare.com. We love to help!